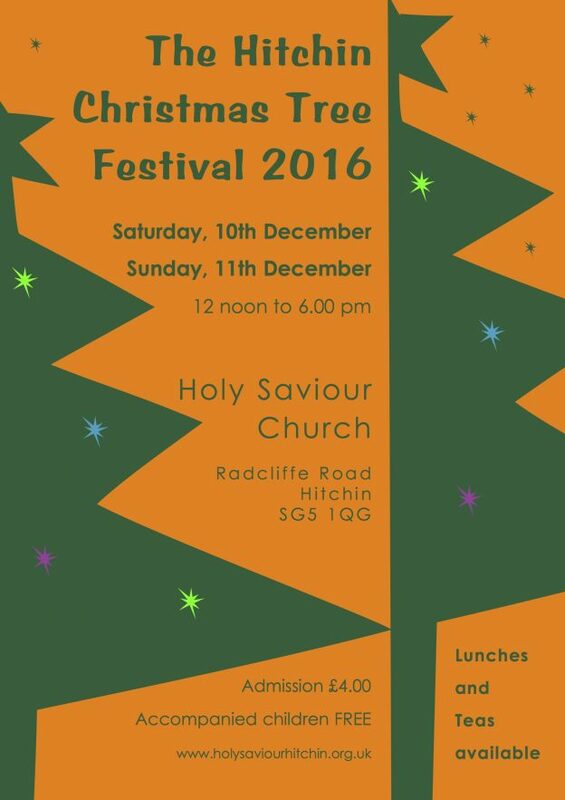 The Hitchin Christmas Tree Festival takes place at Holy Saviour Church, Radcliffe Road, on Saturday 10th & Sunday 11th December, 12noon to 6.00pm. Come and see the amazing display of 50 glittering trees, decorated by groups, families and businesses from across the town and beyond. This will be our 20th Festival, and it’s still going strong! Live music will entertain visitors throughout the weekend, and hot and cold refreshments, drinks and mulled wine will be available in the Festival Cafe. Admission £4 at the door; accompanied children free. The weekend begins with the Christmas Tree Festival Preview and Concert on Friday 9th December. Doors open at 6.30pm, and the Concert starts at 7.45pm. This popular event gives a special opportunity for an unhurried and uncrowded look at the 50 freshly decorated trees, before sitting down to enjoy a concert of seasonal music performed by Holy Saviour Church Choir and The Radcliffe Singers, directed by Trevor Hughes. Admission is by ticket £12 (includes mulled wine and refreshments) from 01462 712212; toryevans@greatgreen.plus.com. This entry was posted in Events on 18/11/2016 by admin.